It’s a day that shouts that fall is finally, really here–steady, gentle rain, cool breeze, a bit dreary–the kind of day that says cook something savory and warming. 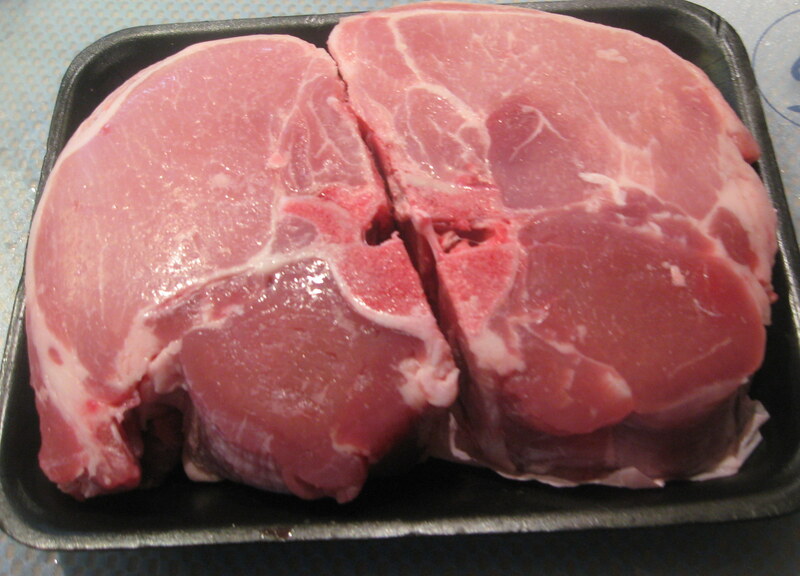 As the weather has been getting cooler, I’ve been anticipating this kind of day, so on yesterday’s trip to the market, I had the butcher cut me two extra-thick, bone-in, loin end pork chops. When I got home, I “prepped” them for roasting–a generous sprinkle of salt (for a dry brine) and let them stand overnight in the fridge. Though it’s not cool enough to turn on the heat, just what I get from the oven while these roast will be cozy, and the smell of roasting pork….almost as good a baking bread. I’ve gotten two chops because I actually want to have extra meat. Leftovers in this case are welcome (which is, admittedly, unusual for me). This kind of weather brings out a desire for soup-making and other hearty fare, and roasted meat is a good starter! 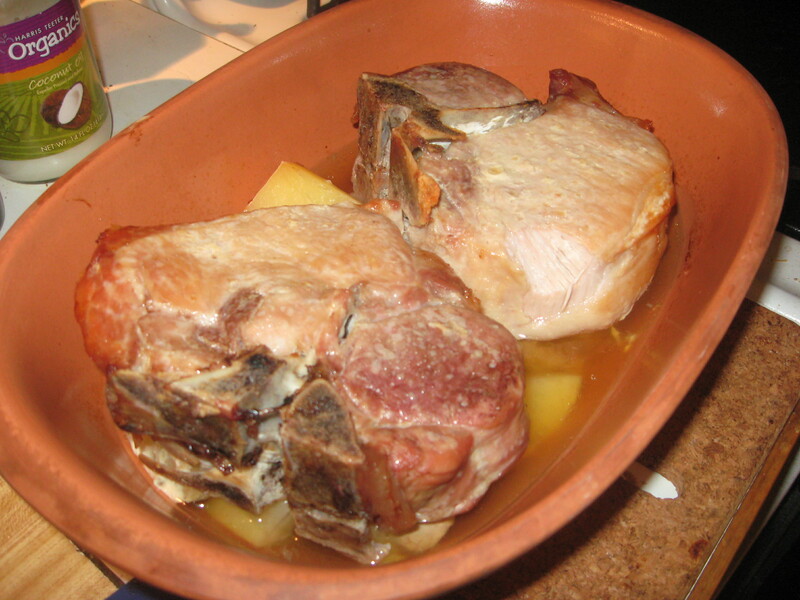 Note: The pork was roasted in the clay cooker–with very simple seasoning. I just wanted some big roasted pork flavor. 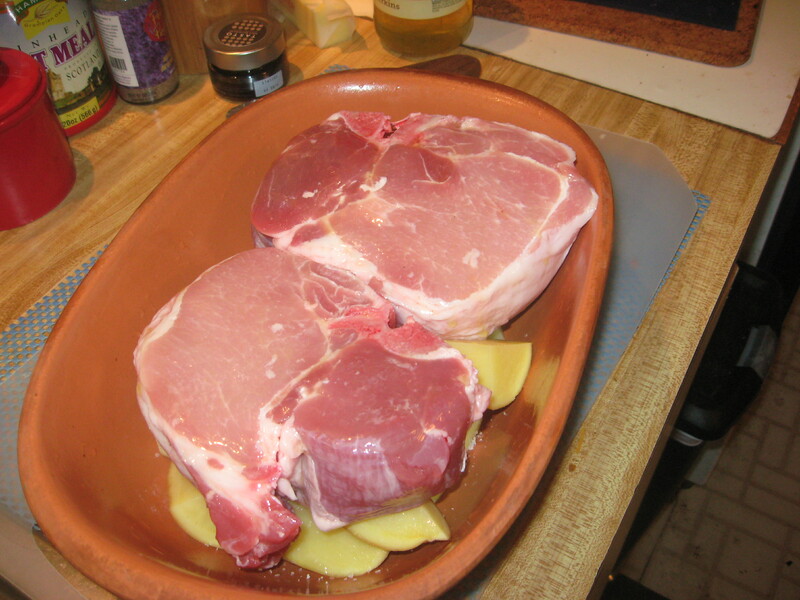 I used loin-end chops here, but thick-cut shoulder chops, or country-style spare ribs will also work. I love the Schlemmertopf/Romertopf for cooking, but you can do this in a Dutch oven if you don’t have a clay cooker. It will still taste good! Pat chops dry and sprinkle kosher salt evenly over the chops. Soak clay cooker for at least 20 minutes, add chops and place in cold oven set for 295 °F until easily shredded with a fork (about 3 hours). Serve with roasting juices from cooker. I made the spicy grilled cabbage from The Kitchn, to go with this. The weather didn’t permit grilling (and lack of planning the oven, therefore the broiler, was in use) so I did a thinner wedge on a smoking hot cast-iron griddle. It was fantastic–no doubt this would be even better on the grill. The spicy lime sauce is yummy (and the bit that found it’s way onto the pork was good there, too). I did make a couple changes to the sauce: since I was lacking the “smoky” grill, I added chipotle chili powder as well as the cayenne, and I used honey instead of sugar. 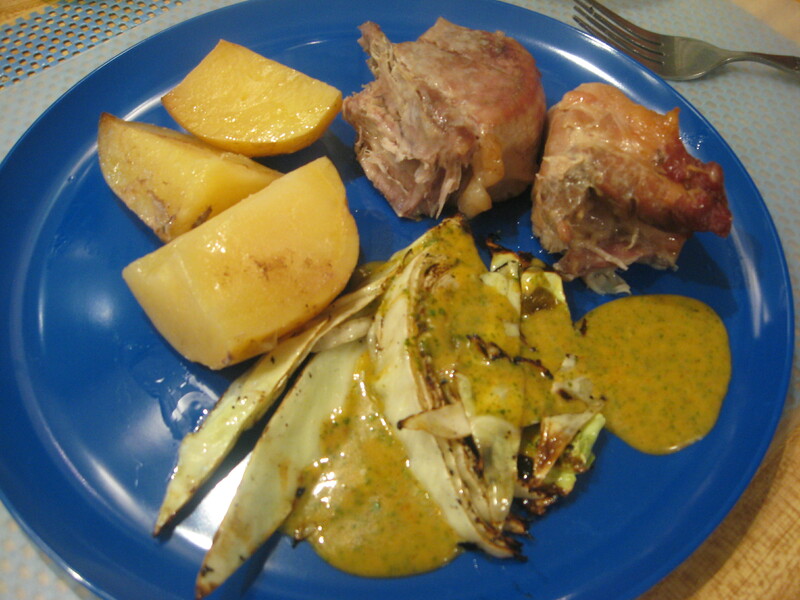 (I would love to try this sauce with buckwheat honey in it, but none in the house today.) Definitely a keeper of a sauce! There are leftovers–but I’ve planned how to use them. The pork is seasoned only with salt at this point–deliberately so that I have lots of flexibility in using the rest of it. I want to try a pasta dish with the “pulled” pork, sage and brown butter sauce. There are roasting juices that will contribute to some good soup–maybe hot and sour soup, or maybe something with hominy and sort of southwestern flavor. I suspect that a serving of basic roast pork is headed to the freezer for a quick comfort-food meal in colder weather.